Throughout the central part of Paris, we visited many historical landmarks, such as the Arc de Triumphe de l'Étoile at the western end of the Champs-Élysées. It honors those who fought and died for France in the French Revolutionary and the Napoleonic Wars. 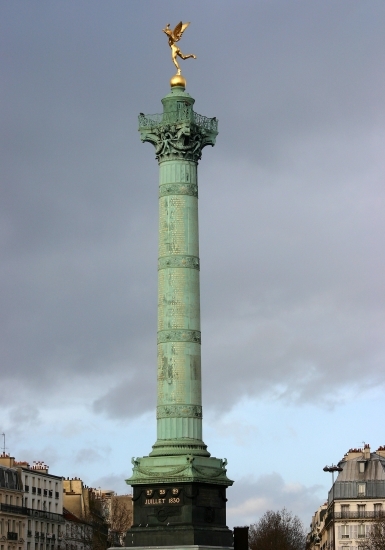 Colonne de Juillet is a monumental column in Paris commemorating the French Revolution of 1830. Nearby were the famous Bastille prison and the former home of Victor Hugo. There were many statutes around Paris, such as the remembrance of Joan of Arc, which we visited on a very rainy day. Like all visitors to Paris, we wanted to see the Eiffel tower. We came by the tower on three separate days, before we could see the tower on a day when it was not pouring rain, or too cloudy and dark for a good picture. The Place de la Concorde is at the eastern end of the Champs-Élysées. It was designed in 1755 with statues and fountains to honor the king Louis XV at that time. During the French Revolution the statue of Louis XV of France was torn down and the new revolutionary government erected the guillotine in the square. It was here that King Louis XVI and Queen Marie Antoinette were executed on 21 January 1793.